Julian and Jeannie live in Deptford Creek. Twelve years ago Julian – a boat builder by trade – rescued an old boat from destruction and brought it back to their moorings in the Creek. Initially, he rebuilt the main cabin and cockpit, and most recently he has been restoring other parts of the boat to get it into shape for the role it's about to play in the Thames Diamond Jubilee Pageant on Sunday. The boat was originally a lifeboat, and like many boats of its age (it was built in 1924), it was converted to a motor cruiser in the 40s. Quite a few working boats were rehabilitated at around that time by amateur enthusiasts for whom sailing and motor cruising would otherwise have been financially prohibitive. But there are very few boats like this remaining, which makes Cathia special enough to be included in the 1000 boats accepted for the flotilla. Cathia will be processing in the Lifeboat Section of the flotilla (a "bureaucratic mishap since it's no longer a lifeboat" says Julian) within the larger category of "Historic & Service". From the tons of paperwork – much of it to do with security – involved in this extravaganza, Julian and Jeannie have gleaned they will be in the middle of the 7-mile long armada, which is expected to take around four hours, with the Queen's barge now confirmed to be leaving Battersea Bridge at around 2.40pm. Firstly Cathia must 'muster' at West India Quay on Friday evening, spend the night there, then progress to the main mustering area west (or upstream) of Hammersmith where they will spend Saturday night. No expenses are paid to the 1000 boats taking part, but Julian's boat is a lot cheaper to run than a car, so he's not too worried if there are delays in this unprecedented use of our river. For those Republicans amongst you who haven't got riverside tickets but still want to catch a glimpse of what is described as a unique spectacle in our lifetime, most of the boats taking part will be 'dispersing' from Tower Bridge after 5pm and must report back to West India Quay, so will be sailing back to Greenwich and can be viewed, from nearby riverside vantage points, sailing past with probably a bit less of the pomp and ceremony, flag waving and bell ringing that will feature in the main event. Julian's request to do a right turn (sorry, go starboard) into the Creek on their way home was disallowed – Cathia must progress on past Deptford Creek, to the 'roundabout' at Greenwich Yacht Club, then come back (via the north bank, since oddly, river traffic takes to the right) to come home. 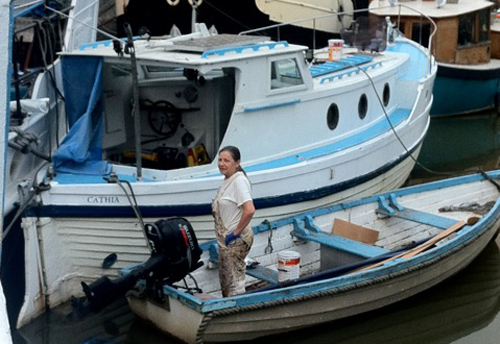 We're especially proud that such a lowly and lovely old boat from Deptford Creek as Cathia is taking part in this special river pageant, and it's hardly a surprise that Julian is also the man behind The Lenox Project – one of the projects put forward by Deptford Is... to regenerate Convoys Wharf. Build The Lenox wants to build a replica wooden 17th century warship in the place it was originally built, the King's Yard in Deptford (Convoys). It aims to create opportunities for all in jobs and training (in both modern and heritage maritime skills) as well as tourism. 'Warship' may not be the first thing that comes to mind when you think about boats, but Lenox was the first in a boat-building project begun in Deptford, overseen by Samuel Pepys, that led to Britain's position as a leading maritime power. Julian's next voyage is this June, to Rochefort in France where the town is about to celebrate the launch of the hull of the replica warship Hermione which they've been building there for several years (from plans made by the English navy whose ship overtook her in battle). Rochefort has much to celebrate – this small town's fortunes have turned with this project, bringing employment, training and tourism, and now has 250,00 visitors a year. For boat lovers in our part of town, there is also an Avenue of Sail to be seen around Tower Bridge from Friday, which features "some of the world's most historic and beautiful boats" which are too large to travel in the flotilla on Sunday. It seems to be free but may be mobbed! See the Thames Diamond Jubilee Pageant website for details. The meeting starts at 7.30pm. All residents are welcome and don't forget you can get baby-sitting expenses if needs be. Email the Chair Tim, if you've got something you want to go on the main agenda. The view of the city on Saturday evening from the Observatory was smashing, only slightly ruined by the Olympic Equestrian site structures on the Queen's Field. The newly restored Cutty Sark and Dome (sorry, O2) were magically lit like Christmas trees. Locals should make the most of this before the park is closed to them in July. Meanwhile, with quite a few security guards looking after the Olympic bits, it seems the Parks Police find it unneccessary to patrol the park to politely ask people to leave before they shut the gates, and nearly 50 stragglers (this author included) found themselves temporarily locked in the park on Saturday night, with the new security team unable to find a key for the main gates. Apparently, it's been happening quite a lot. If you were wondering, as you watch the towers go up at Greenwich Reach, whether there would be a bridge across the mouth of Deptford Creek to Millennium Quay (to make it easy to walk or cycle along the Thames without having to come inland) then you may be interested to hear that a planning application has now been submitted. It's pretty ugly looking, but the proposed bridge has to be high enough to allow vessels to pass underneath at high tide (a lifting bridge is not permitted apparently). The "trapezoidal lattice girder bridge" would be six metres wide and fifty metres long, with lifts at both sides to make it fully accessible. At the same time, the developer, Galliard Homes, is asking for permission to build an extra 22 flats on the two 4-storey blocks (presently under construction and hiding HMS Ocean from view) next to the Meridian estate – "to make the project viable". Public consultation begins next week. A researcher working for Channel 4's Dispatches (October Films) contacted Crosswhatfields last Friday to get some gen on the betting shop situation in our high street. Last night he let us know they would be filming this morning and were looking for locals to speak to camera in a bit of vox-pop to include in a half hour piece they are doing on betting shops, antisocial behaviour and the 2005 Gambling Act. Michael Crick (Political Correspondent and co-founder of C4 News and ex-editor of Newsnight) was doing the interviewing and Dame Joan was coming at 11am to speak about the problems betting shops are causing in our area. It was a bit late notice to contact people who might want to air their views on record, and those not at work today weren't overly keen to speak to camera, fearing repercussions. The shopkeepers we spoke to later said they hadn't been approached – except one who spoke to them but hadn't wanted to be filmed. Another worried that all the bad press was not good for business. A local who met up with the crew just before 1pm was told they already had enough footage. The production team have since told us they "had an extremely productive day". The film is scheduled to broadcast on 18th June. 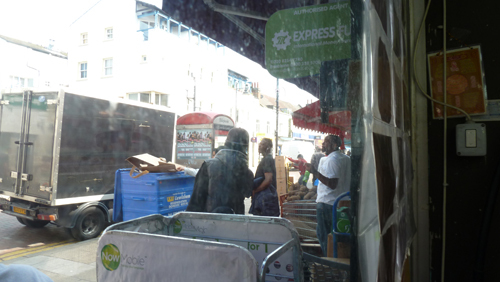 Later today, in the afternoon heat, men were openly dealing drugs opposite Paddy Power, despite (or perhaps because of) the recent drugs bust there. Meanwhile, the street drinkers were gathered in the sun on Reginald Road near the side entrance of Paddy Power, marking the first of their open air summer season parties (which go on every day till the betting shops close). A junkie was begging with his dog outside Greggs and yesterday, there was a rumpus when a couple of shoplifters met with some strong resistance at a pound shop in the vicinity, and were seen off with the help of other shopkeepers (police turned up too late). Last week, some local residents had a meeting with representatives of Paddy Power and Ladbrokes, convened by New Cross Safer Neighbourhoods Team. The residents wanted the bookies to reduce their opening hours and install some security guards – suggestions which met with blank looks from the bookmakers, who are incapable of admitting any real responsibility for the disturbances and crimes caused by their businesses. The onus remains on the police. Earlier today Thames Water released their response to the phase two consultation on the Thames Tunnel Project. Unfortunately Deptford Church Street is still their preferred site for the works. I have written immediately to the Mayor of London asking him to stand by his election pledge to oppose the choice of Deptford Church Street. While Deptford Church Street remains Thames Water’s preferred site there is still some way to go before it is fully signed off and any work begins. I want to assure you that I will continue to work with you and the Don’t Dump on Deptford’s Heart campaign to oppose the use of this site. 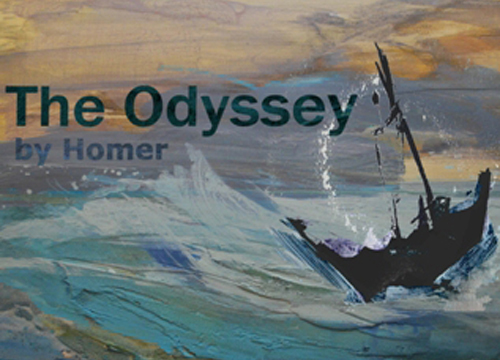 In June, Theatro Vivo (Lewisham's favourite theatre group) will be staging an interactive promenade performance of The Odyssey throughout Deptford – we're told that at least one scene will be set in Crossfields. The company are looking for people from the local community to join them as part of their Community Chorus. If you're over 18 and interested in taking part, email info@teatrovivo.co.uk or call Sophie on 07733 134701. The deadline was 15 May, so apologies if this news comes too late! Tickets have already gone on sale at The Albany for the show, which runs 7-23 June. You can read more about the show on The Albany's website. 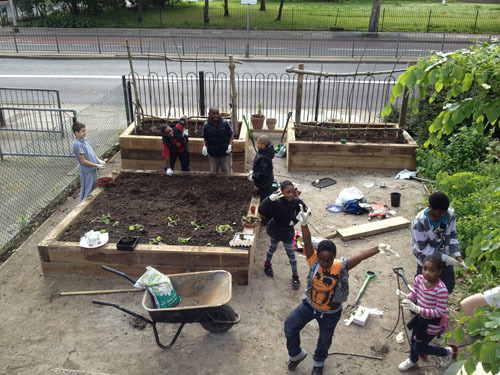 Tim has now set up a blog for news about Crossfields food growing project. If you want to get involved, take a look at thewonkyprong.blogspot.co.uk – we've added it the Local Blogs list (left hand column). The project has developed out of the Crossfields Green Spaces gardening group started by John, who was spurred into action when his allotment was threatened by a plan to run a cycle path through it. His garden was subsequently spared, and John began working with other allotment gardeners on the estate to raise funds to make more of our green spaces. He has since been seriously ill in hospital and fellow gardeners have been looking after his garden whilst Tim has taken over the development of the green spaces. We wish John a full return to health, hopefully in time this year to see – and taste – the fruits of the work being done in his absence. Get well soon, John! In the meantime, if you want to help Tim grow some food, or are interested in gardening on the estate, contact him at squaregardener@gmail.com. Local community 'activist' Pete Pope died on Friday night after a long battle with cancer. The video above is an interview with Pete talking about regeneration in Deptford and was filmed in 2007 by Gopi Sastri, Ellie Walton and Salim A Syed for Deptford TV. More about Pete over at Transpontine. Deptford Misc has posted the details of Pete's funeral. To keep updated join the mailing list. There will be a Mass cycle ride from Deptford to the crematorium, and the Humanist service will be conducted by Billy Jenkins. We posted in April about the EON rep who was using rather unconventional methods to sign up new customers. Jim in Farrer House wrote to Lewisham Trading Standards about it. When he didn't get an acknowledgement of his email, he contacted Crossfields' Estate's new Tenancy Officer, Kerrie Taylor*, who got in touch with Trading Standards on Jim's behalf. This prompted a reply on 1st May from the Senior Trading Standards Enforcement Officer, Duncan Brand. Mr Brand apologised for his tardy response and said he would be contacting EON. He requested that if Jim knew anyone who has signed up to EON as a result of this salesman's tactics then they should "contact the Citizens Advice Consumer Advice Service on 08454 040506 for advice about their rights. If there is a breach of the legislation we enforce they will pass the details to us. Finally, if you would like a No Cold Calling sticker to display on your property then let me know." Jim was tempted to tell Mr Brand where to stick his sticker. Soon after, Crosswhatfields received an alert from the Met Police on 4th May (our apologies for this late posting). The police warning is seemingly unconnected to the EON story, but the advice line number given at the bottom (Consumer Direct) is the same as the one given above. Lewisham Police and Lewisham Council are again urging residents especially the vulnerable to be on their guard following three burglaries today (04.04.12) where the suspects have professed to be working on behalf of the council. Residents are reminded that anyone from Lewisham Council, Lewisham Homes or the Police will always have official documentation or ID to prove who they are. For more information about what to do about cold callers or to report a persistent cold caller, contact Consumer Direct on 08454 040506. Residents wishing to find out more information about cold calling zones can contact Lewisham Council Trading Standards on 020 8314 7759. Linking crime to bookmakers – no problem! Those who have been objecting to Betfred opening shop at the old Halifax site have been waiting to hear the decision of the Bristol Planning Inspectorate after Betfred appealed for the second time (see our January post). Yesterday, anyone who had written an objection should have received an email from the Inspectorate notifying them of a new statement submitted by the appellant. In this 18-page document Betfred argue that the decision made by the Inspector against their last appeal on the grounds that betting shops in the area attract crime and antisocial behaviour was based on rather flimsy evidence. However, as if on cue, the NewsShopper reports today that three men have been arrested over alleged drug dealing at Paddy Power. 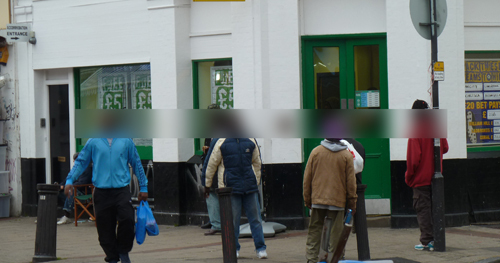 On May 2, New Cross Safer Neighbourhoods Team arrested the men on suspicion of supplying Class B drugs from Paddy Power, Deptford High Street. One man was searched in New Cross Road after leaving the betting shop and five wraps of Class A drugs were found on him. Officers then returned to the bookies, detaining and searching the punters inside. A further man was found in possession of Class A drugs and arrested, while another was given a cannabis warning. At a linked address, police found scales, cling film and cutting implements believed to be used for preparing Class A drugs, along with three bags of cannabis and a can of CS gas. Two men in their 20s have both been bailed pending further enquiries. This news will come as no surprise to some locals, one or two of whom have been following the manager's Twitter feed. So, it appears, have the police. "...no information is given as to the number of reportable crimes relating to Deptford High Street in general or in relation to other identified occupiers within the town centre to identify how the reportable crimes associated with betting shops compare with other shops on the High Street." "Having reviewed the list of reported crimes provided by the Licensing Officer, only one of these relates to a public order offence which could constitute antisocial behaviour, the majority of the other offences listed do not relate to crimes which would impact on neighbouring residents, only to the owners of the individual betting offices. Furthermore, no information is given as to the exact nature of the crimes, particularly in relation to the incidents of criminal damage to be able to adequately assess whether any of these incidents would have impacted on neighbouring residents. No evidence has been put forward by the Council to support their case that a higher number of betting shops automatically results in more crime...Should an individual engage in criminal activity they are not more likely to do so because there are more betting shops. There is a case to be made that in fact it is more likely that with a higher number of betting shops it is less likely that large congregations of customers will result in a single shop and therefore crime and disturbance could decrease." This last statement beggars belief. How little these people understand their customers! Punters will congregate where they find the best deals, and Betfred will no doubt aim to offer better deals than their rivals (if and when they get stake in our high street). In Paddy Power's case, the best deals have also included Class A drugs! Betfred will argue that they'll run a cleaner shop than their (potential) next door neighbours – the very same promise made by those other identical corporate billion pound businesses when they moved into this 150 meter stretch. Paddy Power, meanwhile, continues to break local planning laws with their unauthorised building alterations, as well as breaching the terms of their gambling license by allowing crime to be conducted on their premises. One of the Licensing Objectives is: "preventing gambling from being a source of crime or disorder, being associated with crime or disorder, or being used to support crime." This, as we have learned previously, is interpreted in law as crime = "serious organised crime" and disorder = "riots". So it will be business as usual at Paddy Power, who can now claim to be "creating a new job in a vibrant town centre". Of course all this is not to say that all betting shop punters are criminals, or that all the blokes who hang outside for a tinny and a smoke are up to no good. Indeed the Safer Neighbourhood Teams know exactly who the regular offenders are. But it should be noted that Lewisham Met's Licensing Officer has failed to supply updated crime statistics to back up in law what everyone who lives or works on the high street knows to be the case. Betfred state: "It is also relevant that the Witness Statement prepared by the Licensing Officer is unchanged from the response provided in relation to the previous application submitted in February 2011." Such laziness may well lose the case on a technicality for the good people of Deptford. As we posted here a couple of weeks ago after a tip-off from a reader who keeps an eye on Port of London 'notices to mariners', there will be a fireworks display lasting about 10 minutes from barges positioned mid-stream in Greenwich Reach off the Old Royal Naval College tomorrow, Saturday 5th May at 9.45pm. 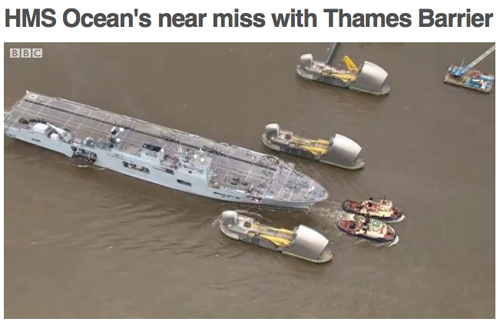 Here is the Navy's largest ship navigating down the Thames around midday today. Click here to see the BBC video. The BBC reports: A large-scale exercise to test the military contribution to the Olympics security effort has been taking place. 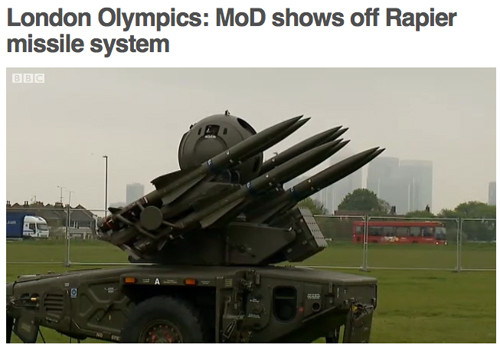 Tests of air defence missile systems at six sites across London using dummy armaments have begun. And Typhoon jets, based at RAF Northolt in west London, will take to the skies over south-east England with Lynx, Sea King and Puma helicopters. Exercise Olympic Guardian, which goes on until 10 May, will also see HMS Ocean sail to Greenwich in the capital. Military chiefs have warned residents of an increase in loud air activity. Meanwhile, the Blackheath Bugle has been keeping a wary eye on the Blackheath Missiles and has alerted us to this scary BBC video, filmed yesterday when the army demonstrated their weapons capability on our lovely heath. Also see our March 20th post about the military build up in Greenwich. Don't forget to vote today – at Deptford Lounge until 10pm. You don't need your polling card.